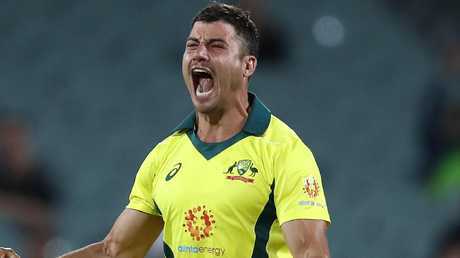 AUSSIE all-rounder Marcus Stoinis shone in the field for Australia as they broke a seven-match losing streak with a tense seven-run win over South Africa in Adelaide on Friday night. Stoinis had the golden arm last night, picking up three key wickets and a run out as the hosts successfully defended a modest 231 after struggling with the bat in the first innings. On Thursday former Aussie star Simon O'Donnell questioned whether players still cared about wearing the green and gold, saying the honour in representing their country was "dead". Well, Stoinis showed that was anything but true, roaring with pride every time he took a scalp. Marcus Stoinis was on fire in the field. The medium pacer finished with 3/35 from 10 overs - his second best bowling figures in ODIs. His short ball to Heinrich Klaasen was on the batsman quicker than he realised and he spooned a catch to mid-wicket, then he snuck a ball past Dale Steyn's defences to hit the stumps and grab his second victim. With the game still in the balance Stoinis then dismissed topscorer David Miller (51) LBW after a passionate appeal. His desperate plea was initially rejected by the umpire but he convinced captain Aaron Finch to go upstairs for a review and he was rewarded when replays showed the ball was crashing into off stump. The Aussies were huddled around looking up expectantly at the big screen for the decision and when the good news arrived they exploded with pure jubilation. Nobody was more animated than Stoinis. After every wicket he let out a huge roar. Veins were popping out on his neck, his eyes were open wide and it looked like his shirt would burst. Stoinis was a ball of emotion ready to explode. "Your emotions had a bit of everything," Fox Cricket reporter Neroli Meadows said to him after the match. After throwing his wicket away for two, Stoinis started his redemption mission in the 10th over when he ran out Aiden Markram. Chasing a ball into the leg side, his rocket throw from the outfield caught Markram short. A man who looks like he spends plenty of time in the gym, Stoinis's right arm had enough bicep curls behind it to make sure the ball beat Markram in a two horse race. Fox Cricket commentator Mark Howard couldn't take his eyes off Marcus Stoinis's bulging biceps in the pre-game show as he interviewed a couple of the players during their warm up. After checking in with leg-spinner Adam Zampa, Howard gushed over Stoinis as he did a couple of push ups for the camera. "Look at the physique on this man, Marcus Stoinis," Howard said. "Look at the arms and the triceps on this man. Stoin, you're looking good today. "Have a look at those (muscles). The boys, they know he is the body in the team." The Aussie all-rounder had his sleeves rolled up to give everyone a good look at the gun show and as Adam Gilchrist noted in commentary later, Stoinis wasn't in a hurry to roll them back down when he was front and centre on TV screens around the country. Asked about his exuberant celebrations after the match, Stoinis said: "It was my emotion coming out. I'm so passionate, I love playing for Australia. "All the guys that are in that team fight so hard and want to be there so much, train so hard and think about cricket every day. 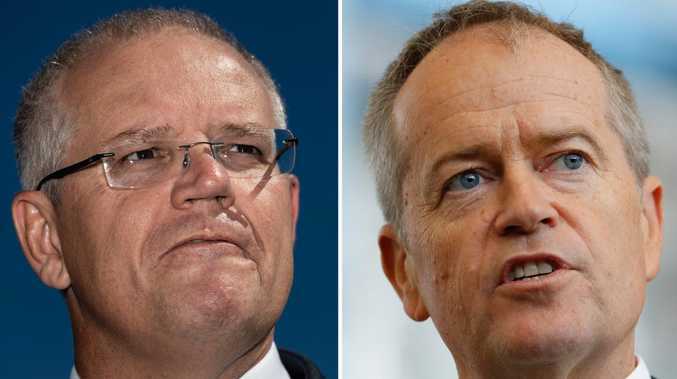 "I know obviously we haven't got the results that maybe the media and the Australian public would want but these guys, we all fight. "The character of the individuals speaks for itself."